Part of the fun of food photography involves hunting for new places to find foods for stock images or blog photography. A gorgeous food photo starts with, well, gorgeous food. And you won’t find a better selection of truly photogenic raw ingredients than at a farmers’ market. Natural markets, bakeries, ethnic or specialty food shops, and delis all offer a large selection of ready-made foods for sale. These resources can provide fodder for amazing imagery for your portfolio. Farmers’ markets are great places to shoot raw ingredients for stock and to find farm-fresh ingredients for dishes to create. The freshness and immediacy of earth-to-table really translates in photos. Check out the tomatoes in the following figure. 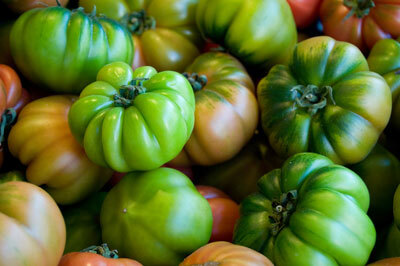 Green heirloom tomatoes look fresh enough to taste. Although a beautiful group of heirloom tomatoes can create a pleasing look, sometimes finding more rustic offerings can be fun. Searching out some unwashed fruits or veggies with bits of dirt attached can foster unique, striking photos, as shown in the next figure. The earthier the better! 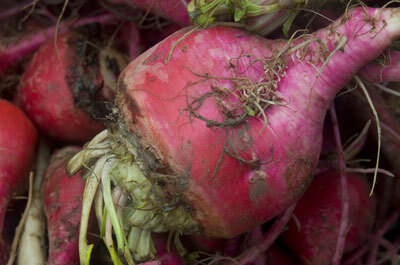 Keeping it real with these dirty, rustic beets from the farmers’ market. Oftentimes, the booths at farmers’ markets have white tents overhead that make for a lovely, diffused light falling on the fruits and vegetables, as shown in the following figure. 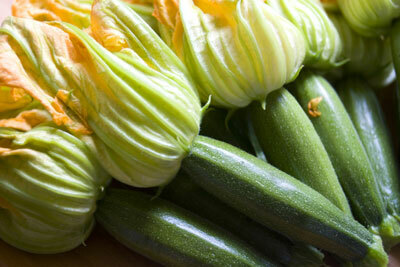 Zucchini blossoms from the farmers’ market glow in a diffused light. Farmer’s markets aren’t about only fruits and veggies these days. You may be lucky enough to come across some unique prepared foods that are beautiful to capture for stock or blog photos. When traveling, grab your camera and check out the farmers’ markets in the local area. The regional specialties, along with interesting display methods, make for some lovely and uncommon photographic opportunities. Bakeries are some of the best places to find gorgeous items to photograph for stock images, such as the cupcake in the following figure. 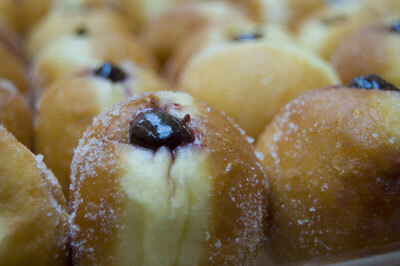 Doughnut shops, trendy cupcake stores, and traditional or ethnic bakeries can be huge resources for your stock photos. 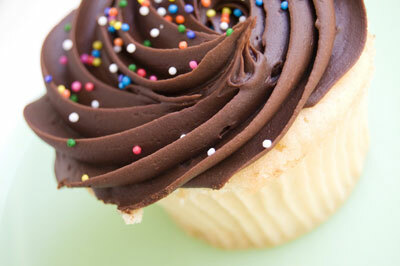 A delicious cupcake makes an appetizing photo. Many people have a sweet tooth and images of pies, cakes, tarts, petit fours, doughnuts, or even a good clafoutis now and again can evoke a positive reaction. Just take a look at the following figure. Now don’t you feel happier? These sugared jelly pastries look divine. When purchasing items at bakeries, don’t be shy about pointing out a specific baked good that you think looks the best in the group. You may get a few eye rolls from the staff, but if you explain what you’re using the food for, people will generally be happy to accommodate your needs. Gathering prepared foods is a fun, easy (and delicious!) way to get some terrific stock or blog shots for your portfolio. The recent explosion of large, health-conscious groceries, such as Whole Foods Market, provides a great starting place for your search. These types of natural food groceries generally offer a wide selection of beautifully prepared foods that are made just for photos. 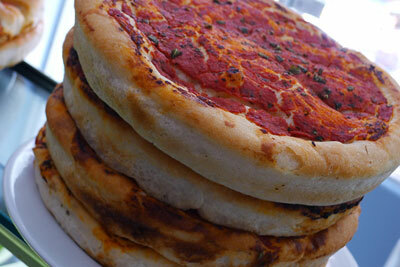 Beautifully prepared foods are just waiting for their close-up. You may also be able to find some unique specialty shops or delis in your area with prepared food to go. These smaller, specialty retailers can offer a great range of foods, including breads, salads, sandwiches, pizzas, pastas, honey, cheeses, and much more.